Larry Prellop was born and raised in Austin. His parents owned property on Lake Travis, where the youngster began his love of water. As a teenager, Prellop attended school, went to work, and then spent his evenings painting while he watched television. His mother, who worked at the State Board of Insurance, would sell Prellop's paintings for $25 to $50 to her coworkers. "This was the first time I realized I could make money as an artist", he said. From that point on, Prellop began entering small arts and crafts shows throughout Texas, with the goal of eventually becoming a gallery artist. He credits Porfirio Salinas, Robert Wood and A. D. Greer as the biggest influences on his work. Eventually, numerous galleries began buying Prellop's paintings. In 1979, his work was published by Scafa-Tornabene, a New York-based art publishing company. He is currently published by Modern Art, a European art publishing company. Outside of Texas, Prellop is known primarily for his seascapes, which depict the rugged impact and drama of the Pacific Ocean. His seascapes include lighthouses, ships and marine objects. 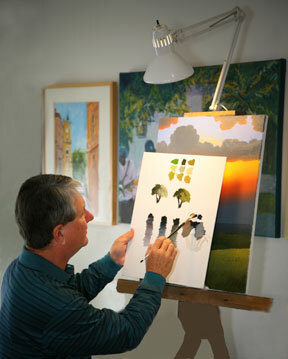 Once he opened his Salado gallery in 1995, he began to paint Hill Country bluebonnet scenes. "I could sell my seascapes worldwide, whereas bluebonnet paintings sell mostly in Texas," he explained. Prellop's paintings are mostly of nature. While he doesn't paint people, he occasionally includes animals in his scenes. In addition, he doesn't paint many buildings, although occasionally barns or windmills are depicted. "I like to focus on the natural beauty of the scenes," he explained. In 2001, Prellop created a painting depicting a magnificent Texas Hill Country scene for Keep Texas Beautiful, the nonprofit state affiliate of Keep America Beautiful. The organization honored Prellop and his work as a visual link between the environmental efforts of volunteers across the state the natural beauty of the Texas Landscape. Prellop’s landscapes and seascapes are well known throughout Texas and the United States. His paintings are in the private collections of Governor Rick Perry, former Texas governors such as Governor Briscoe and other prominent elected officials such as Senator Lloyd Benson and Congressman Ken Marchant. His paintings are also in the corporate collections of Criterion Corporation, Southland Corporation, and the Texas Banking Association. His art is distinctly realistic whether he is capturing the quiet water of a hill country stream or the pounding surf of the Gulf of Mexico.